Everything you need to get started with solder paste stenciling. Stenciling is a great way to evenly apply solder paste across all of the SMD pads on your PCB and makes quick and easy work of assembling your components by hand. This is the method of choice for many hobbyist electronics designers that need to work with dozens of prototypes, but it’s not just made for use at home. 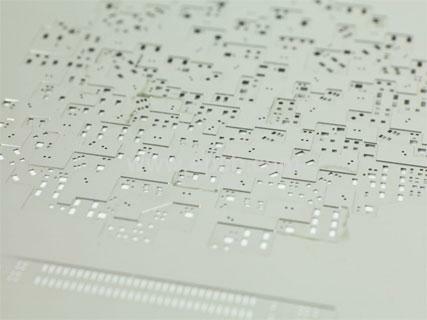 You’ll also find stencils being used by PCB manufacturers to apply solder paste on your board, and then use high-tech machinery like pick-and-place machines and reflow ovens to glue everything together. Secure. You’ll first secure your PCB in a proper position, so it doesn’t move around when you apply solder paste. Align. Next, you’ll align your stencil over your PCB, so each hole lines up with each pad on your bare board. Fiducial mark can help you a lot in this process. Apply. Then, you’ll apply a layer of solder paste at a 45-degree angle over your stencil with a plastic card. Inspect. In this step, you need to remove the stencil from your PCB and inspect it to make sure every pad has solder paste deposited. Attach. If everything looks good, you can move onto the process of attaching all of your SMD components. Heat. Finally, you will reflow solder your board with the help of a reflow oven of your choice, whether that’s an electric skillet or a modified toaster. Previous： What Causes PCB Failure?